Actual Reminder - Best Reminder Software! Actual Reminder - The best reminder software! Actual reminder is an effective program-calendar for all kinds of reminders. This date reminder helps you to organize your work and daily life. This reminder software has a user-friendly interface with skin support. Simply in a few clicks you will be able to add a new daily reminder, holiday reminder, birthday reminder, meeting reminder, etc. You will have the option to customize the description and sound. 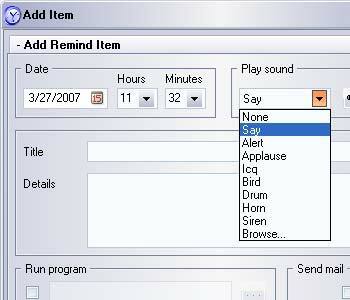 For every reminder you can choose music from the existing data base or insert your own (wave, mp3, wma, midi). Also you can choose any program from your PC to run. Actual Reminder is email reminder. You can setup automatically sending E-mail when needed for reminding. For birthdays or holidays you can choose pictures or photographs of the one whose name-day it is and automatically send him a greeting card. In the birthday reminder you can choose any pictures or photos you like. It is possible to view your daily reminders and automatically get noticed of future events and tasks every time you need. 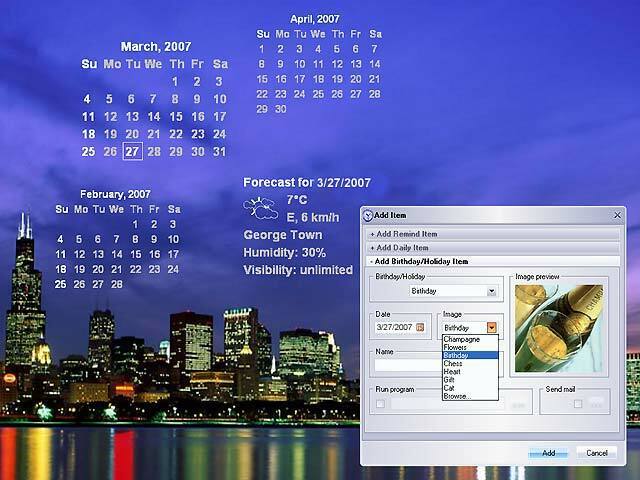 This calendar software works as a speaking clock and reports time every hour. You can set up the image for the desktop calendar for the current month in the program. You can set time and choose pictures for automatic change wallpapers on your DeskTop. In this reminder program you can manage your PC. You can set time to shut down, reboot, log off or sleep mode of the computer or you can do that immediately. This is a holidays reminder. It reminds about holidays in different countries. Actual reminder is reminder popup program. It starts up hidden in the system tray. All the settings are easy to access and you can turn on or off any option any moment. If you do not want to miss an important event or a meeting you need Actual Reminder! Set up important events, specify date and time, choose a sound alarm for each important task and you will be the boss of your time! Due to the handy and easy form, the product is easy to operate by any user. Your experience does no matters! It is easy to add a new reminder. It is not necessary to fill all the fields. It is enough to write heading and choose the time of reminder. For each reminder it is possible to select a date with a sound alarm, which you can choose to your taste. Keep all your important information handy with this speedy, compact and user-friendly software. 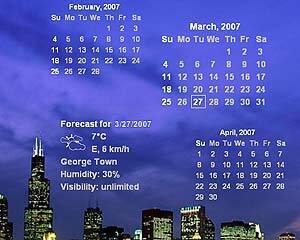 The program presents a convenient weather forecast for your city for current day and for five days forward. Also voice assistant, by pressing only one key at any moment will tell to you about the weather outdoors. For showing the weather forecast you need to connect to Internet periodically, (minimum once a day). Thus the program itself defines that there was a connection and updates data. The size of reception and data transmission is only some kilobytes, that is why Actual Reminder does not stir to other programs to work in the Internet. First of all, it is necessary to choose city in which you live in "Settings" in a bookmark "Weather forecast". If you have not found the city in the list, press button "Find" and in pop up window write the name of city in Latin letters. Remember, that if in your city there is no meteorological station you cannot find it in the list. Here (in settings) it is possible to choose frequency of automatic updating of data in the Internet or to add "Manually". It is possible to establish or disconnect displaying the current temperature outdoors in the System tray. 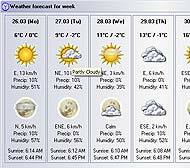 Current weather forecast will be displayed on the desktop (if this option is not disconnected in "Adjustments" in a bookmark "Weather forecast"), and also after prompting the mouse cursor on an icon of the program and choosing "Weather Forecast". Using hot keys you can look through weather forecast for five days or listen to current weather forecast in your city. Weather forecast for the chosen city for the nearest days will be displayed in the pop up window. You can change the display of weather forecast (for 3 and 5 days). There are thousands of cities around the world in a program database.